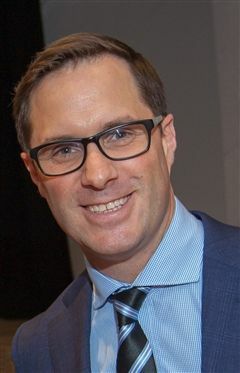 President Grace Cotter Regan P’12 and the Board of Trustees are pleased to announce that Mr. Adam Lewis has been selected as the next principal of Boston College High School. Mr. Lewis will begin his role effective July 1, 2019. Mr. Lewis, a native of Australia, is currently serving as principal of Loyola School in Manhattan, NY. Prior to his role at Loyola, he was the director of senior campus at Xavier College in Melbourne, Australia, a Jesuit school serving 1000 boys. As Deputy Principal of Saint Ignatius College Riverview in Sydney, Australia, he led a Jesuit school for 1500 boys. He has also taught history and English at Clongowes Wood College SJ, an all-boys Jesuit boarding school in the county Kildare, Ireland and taught English at Sacred Heart R.C. Secondary School in London, United Kingdom. Mr. Lewis is a graduate of the Australian National University with a Bachelor of Arts in History and a Bachelor of Science in Psychology. He holds a Graduate Diploma in Education from the University of Canberra. Additionally, he received a Master of Arts in Applied Developmental and Educational Psychology from Boston College. "I firmly believe in the importance of a holistic education that is rooted in Jesuit ideals and values. Specifically, an education that is Christ-centered and one that is geared at providing an all-round education that inspires young people to develop their faith as an ongoing process, strive for justice and commit to the service of others. I realize that in order to accompany students on their faith journey, the examination and exploration of my own faith must be continuous and a reflective process, to which I am deeply committed. This necessarily needs to be underpinned by an education that is academically rigorous and one that marries a classic Jesuit liberal arts academic curriculum with contemporary market forces and demands. "As an Ignatian educator, I strongly believe that I have a responsibility to provide an environment that nurtures individual differences and fosters growth of the whole person. Cura Personalis, therefore, is the central tenet of my educational philosophy. This capacity to care for the entire person in the context of a high school is reliant on the quality of the relationships between faculty, staff, and students, as well as their sense of connectedness with the school and its inherent culture and values. These necessarily concomitant factors of ‘relationships’ and ‘connectedness’ are key in terms of the capacity of faculty, staff and students to engage with their education at an intellectual, spiritual and emotional level. "There is a symbiotic relationship between the quality of cura personalis and intellectual learning and growth. While I acknowledge that at one level the following is an extremely simplistic notion, I believe that people learn, grow and thrive when they are happy. They are happy when they are well cared for and to care for them it is necessary to be committed to understanding their context and to be truly present to them. This is congruent with the seemingly ubiquitous shift to a systems theory approach in terms of understanding human development and one that I subscribe to unreservedly. That is, such theories that promulgate the active agency of the individual (in the context of a high school) in terms of their own development and growth, the bi-directionality of their relationships with others, the importance of context and the cumulative, mutual affect of the variety of settings in which they exist. However, the key is that the student is placed firmly at the center of the model and this, in itself, is symbolically representative of my own educational philosophy. Central to my educational philosophy is an emphasis on the process of learning, rather than a mere focus on the product (while acknowledging the importance of physical results and outcomes). This process is encompassed by the Ignatian Pedagogical Paradigm, which emphasizes experience, reflection, and action. While this has a clear application from a pedagogical perspective in the context of the classroom, it has become part of my ‘skin’ as an educator and is inextricably linked to my educational philosophy, at a theoretical and practical level. "One’s educational philosophy shifts over time and indeed this has been true in my case, based on the following reality: in order to educate, form and transform people into self-aware, responsible, 21st century global citizens who, at their heart, have a sense of responsibility that transcends themselves and a deep commitment to serve others for the greater glory of God, courage and a commitment to be counter-cultural is required. An unwavering commitment to this end and the formation of contemplatives in action anchors my educational philosophy."